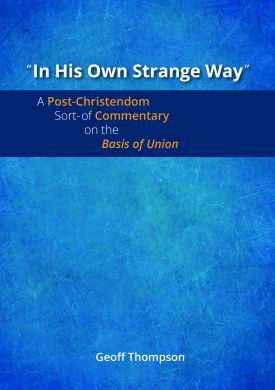 Last year I published (through MediaCom) a short commentary on the Uniting Church's Basis of Union. This is the second of four posts, each of which consist of the commentary on a selected Paragraph from the Basis. The first post - which includes a bit more detail about the purpose and structure of the book - can be found here. The third post will be published in due course. If this whets your appetite, you can order the book through MediaCom or CTM Resourcing. There's also a short article about the book in the NSW/ACT Synod magazine, Insights. Commentary on Paragraph 5 of the Basis. In Uniting Church discussions about the Bible you often hear the phrase, ‘I read the Bible metaphorically, not literally’. It is often said as if it is evidence of great intellectual insight. It isn’t. It is actually a quite unsophisticated claim which tells us nothing at all about what is involved in reading the Bible. Ironically, it replicates the same ‘flattening’ of the reading techniques pursued by the literalism it opposes! What, for instance, would it mean to read Paul’s letters as metaphors? They’re letters! And as letters – and ancient letters at that – they require quite complex reading strategies to interpret them. In fact, this is one paragraph where it is worth hesitating before appealing to a contrast between Christendom and post-Christendom. The all-too-common literal/metaphorical contrast reflects the dominance in our discussions of the question of how to read the Bible. This itself is a reflection of complex and enduring shifts in the study of theology during the last few centuries. Suffice to say that in academic theology, the discipline of hermeneutics – the study of interpretation – developed in a way that the question of how to read the Bible became detached from the questions of what the Bible is and why and where it is to be read. This was not the case in earlier centuries. The questions of how, what, why and where were held together in theological reflection on the Bible in ways that can be very instructive for us today. In this crucial paragraph, the Basis prompts us to learn once again to ask all of those questions. After all, what’s the point in having sophisticated theories of how to read the Bible if we don’t know why we are reading it? So, let’s start by looking at what this paragraph tells us about what the Bible is. It tells us that the Bible consists of the books of the Old and New Testaments. The Bible is a two-volume anthology of the formative literature of Judaism and the early Christian movement. These two volumes are also given their respective classic theological designations ‘prophetic’ and ‘apostolic’. By consisting of these particular two volumes, the Bible has some significant theological tensions built into its very structure. The tensions are never resolved. We have to live with them – and that’s one of the things that makes reading and interpreting the bible so interesting and never-ending. But the tensions are not confined to the relationship between the two volumes. The paragraph also refers to the "witnesses". The plural is deliberate. There are diverse theologies not only between the Old and New Testaments, but also within each of them. Reading the Bible, therefore, is like eavesdropping on a conversation amongst a group of wise, probing and authoritative teachers, prophets and pastors. The topic of their sometimes heated and disjointed but intentional conversation is God’s history with Israel which had come to such sharp focus in Jesus. The word "witness" is important for another reason. By using it, along with the closely related word, "testimony", this paragraph reminds us that the literature of the Bible points to events and experiences which the human authors of the literature did not invent. This same principle applies to the use of the word "received" in describing how the church has come to have the Bible in the first place. When it confesses that "the church has received the books" of the Bible, the Basis is using a theologically finely-tuned word. It’s a way of holding together two distinct convictions. On the one hand, the church affirms that the Bible derives its authority from God. On the other hand, the human actions and decisions that led to the Bible’s existence must be acknowledged and honoured. And that’s the key reason why the question of how we read the Bible is so important. What, then, about why we read the Bible? Interestingly, the answer to this also addresses the issue of what holds this diverse collection of literature together as a single entity. The Basis tells us that the Bible is “testimony in which it hears the Word of God”. For the Christian community, the phrase ‘Word of God’ has always been linked to Jesus Christ. In other words, the Bible is a witness to Jesus Christ and we read it to hear his word to the church. It is of course Jesus who is the reason for the existence of the Bible. It is the proclamation about him which holds the Bible together. If Jesus had not been proclaimed as Israel’s Messiah, what we know as the New Testament literature would never have been written. And if he had not been proclaimed as Israel’s Messiah, the New Testament would never have been added to the Old Testament. There would be no Bible. Finally, what about where we should read the Bible? Here the Basis makes a quite striking claim: “The Word of God on whom salvation depends is to be heard and known from Scripture appropriated in the worshipping and witnessing life of the Church.” Neither the academy nor private devotions as regarded here as the normative place for reading the Bible. As the means of encountering the Word of God, i.e. Jesus Christ, the Bible is to be read in the midst of the church’s active life. The very activities of praying and proclaiming, of serving the transforming the world, of forming disciples and listening to prophets, all shape our reading of the Bible. All of them prompt ever-new questions which fine-tune our listening to the Word of God. And we must take seriously what it means to read the Bible with the whole church. Uniting Church theologian, Dr. Ji Zhang, has rightly pressed many of us to recognise that the Churches of Asia, Africa, Pacific and the Middle East are reading the Bible and listening for the Word of God in contexts characterised by severe poverty, religious pluralism, the adverse effects of climate change, persecution and marginality. What they hear as they listen must also become part of our listening for the Word.